Standing among students petting therapy dogs and getting flu shots, Student Government President Max Kneis thanked the CVS Health Foundation and the American Cancer Society for giving the University of Pittsburgh a $20,000 check for one of the University’s health initiatives — curbing tobacco use at Pitt. “Student Government Board encourages students to commit to the practice of good self-care, and we must all work to prevent unhealthy personal habits that could hinder the advancement of ourselves and others,” Kneis said. Kneis spoke at Pitt’s seventh annual HealthyU Fair, held on the William Pitt Union’s lawn from 10 a.m. to 2 p.m. Monday. More than 40 organizations attended, including the Student Academy of Audiology — whose table included information about how students can take better care of their hearing — and the Magee-Womens Hospital, which featured information about various types of birth control. Kneis opened his speech by encouraging students to take full advantage of the Year of HealthyU and explore the eight dimensions of wellness Pitt is promoting, such as financial wellness and spiritual wellness. “As busy college students, it’s easy to forget to focus on our own well-being,” Kneis said. “I hope the initiatives and events that take place this year remind us to do just that. And then he announced that Pitt is continuing to look into becoming a tobacco-free campus. “SGB looks forward to working with the Breathe Easy Committee on continuing to explore the possibility of becoming a tobacco-free campus,” he said. Marian Vanek — Pitt’s interim director of the Wellness Center — said the University was pleased to receive a grant from the CVS Health Foundation earlier this week to support the Breathe Easy Committee’s work toward reducing tobacco use at Pitt. CVS Health Chief Executive Officer and President Larry Merlo serves on Pitt’s Board of Trustees. “Our Breathe Easy Committee has worked for the past two years to inform the University community about the benefits of Pitt becoming a tobacco-free campus, and this financial support will enable us to continue our educational efforts,” she said in a press release. The Breathe Easy Pitt campaign began in fall 2015. Co-chaired by Vanek and Dean of the Graduate School of Public Health Donald Burke, it is composed of students, faculty and staff. Pitt’s undergraduate and graduate student governments have been working with student leaders on the Student Health Advisory Board to garner support for the campaign. “We have a shared vision that, ultimately, we want to help young people either refrain from using tobacco products that cause great harm or stop using tobacco products through cessation programs,” Vanek said in the release. Kneis said in an email Monday night that the University applied for the grant in the spring and was one of 127 schools selected to receive funding. Student Health will hold the funds, but a team of students and staff — including representatives from SGB’s Wellness Committee — will decide how they are spent. “The funds will be used for educational events and surveying the campus about smoking habits and gathering input about an eventually smoke- or tobacco-free policy,” Kneis said. SGB worked closely with Student Health and the Graduate and Professional Student Government in applying for the grant, Kneis said, passing a resolution last spring and including a letter of support in the application. They also teamed up to send a preliminary survey to gauge opinions of smoking on campus last spring. Kneis said it is premature to talk about addressing any backlash that may arise from a tobacco ban. “One of the goals of this grant is to better understand how the campus feels about tobacco usage, so we can enter into a dialogue where all views can be discussed,” he said. Kneis also said he thought the HealthyU Fair was successful in helping students learn how to improve their overall health while also being entertaining. Some students, such as first-year computer science major Anvay Buch, came to the fair for practical purposes. “I had the flu earlier this semester so my friend told me about the free shots here,” Buch said. 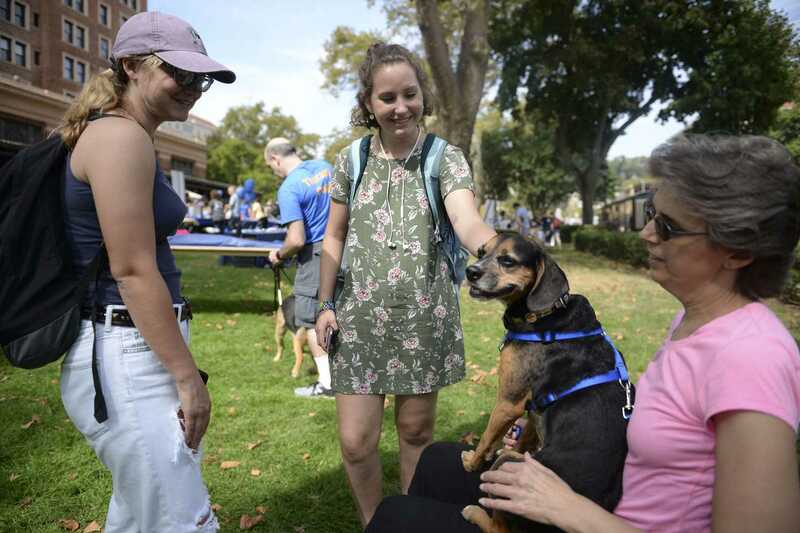 Others, such as first-year biology major Sasha Geyfman arrived to partake in some of the fair’s lighter attractions, such as games and refreshments. “I’m just here for the free condoms and dogs,” Geyfman said. The Pitt News incorrectly identified CVS Health Chief Executive Officer and President Larry Merlo as its Chief Operating Officer in an earlier version of this article. This mistake has been corrected. The Pitt News regrets this error.